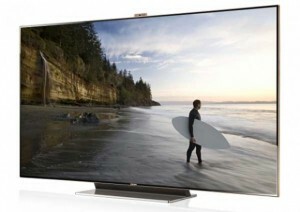 A new TV was unveiled few weeks back – 55-inch OLED TV the Samsung ES9500. Heard about LED TV! But what is OLED TV now? 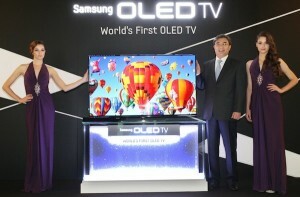 Well, there is a new TV technology in the town called Organic Light Emitting Diodes (OLED). What is the difference with current LED TVs? The OLED TVs are brighter, more efficient, thinner and with best contrast than even plasma TVs. They use Organic films between two conductors and emit the light when electric current is passed through them. OLEDs consume less power than LEDs and use no bad metals which makes them environment friendly. 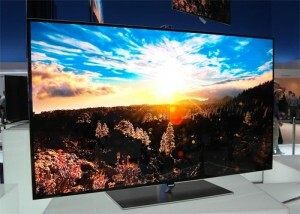 The TV is as thin as 0.3mm with best viewing angle of 180 degrees. Samsung ES9500 is made up of single pane of glass and gives the ultimate picture quality and true-to-life experience. Samsung ES9500 OLED uses ‘True OLED’ RGB sub pixels, as opposed to other TV brands. This also differentiates the OLED TVs from LED TVs. The ES9500 OLED TV promises rich colors and faster response times than traditional TVs. The OLED panel has self-emitting sub pixels to be able to produce lifelike colors in each individual sub-pixel. Samsung claims that the self emitting sub pixels will have capability to produce unparalleled detail in shadows and shapes. Let’s talk about the ES9500 specs and what it offers to you. All the features of a SMART TV are inbuilt in this ES9500 OLED TV. The Samsung ES9500 is 3D ready and includes all of Samsung’s interactive features seen on some of the top-tier TVs out now.It features Smart Interaction with Voice Control, Gesture Control, and more. It takes the quality of LED and LCD TVs in totally a different world. It features Smart Multi View Technology that will allow two people to watch two different programs at the same time on a single screen. They can have separate audio feeds (using their 3D glasses) to get a feel of watching 2 TVs at the same time. One wonderful thing about Samsung ES9500 is that it allows you to upgrade the TV to latest technologies in television so that your TV will never go out of date. The Smart Hub features a host of apps (over 1500) with some free 3D content provided by Samsung (3D World), and a full web browser. The Samsung ES9500 OLED TV needs no separate light source and can provide a screen response time that Samsung says is 1000 times faster than a traditional LCD TV. This will enable user to watch the action movies and fast actions much smoother. It is backed up by 1GHz dual core processor which enables multitasking quite smooth. You can easily run multiple apps parallel to each other without any glitch. The colour reproduction is 20% better compared to LEDs and LCDs. No current plasma or LCD TV can match the colour reproduction or black levels that the ES9500 is capable of. All the cables are fitted internally and concealed which gives the TV a stylish look. The A/V ports are also concealed in the L-shaped panel. There is also a pop-up camera on the top of the screen for interactive chat conversations. With all these features one must be curious about the price of Samsung ES9500. Yes, the price is little on the higher side, ranging from $8800 to $10000. However because of its picture quality and form-factor implications, person who would like to spend more for true life experience will not think more about the price. There are some questions still to be answered though especially on OLED TVs, like what is the panel longevity, what is the relative speed of wear and tear of the sub pixel and its effect on overall pixel color, how long will the panel last etc. 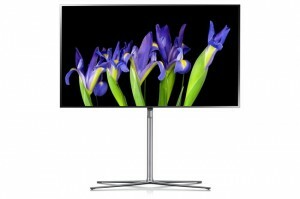 This is all about the Samsung ES9500 OLED TV specs and features, need to see where the OLED technology goes.